Yes Virginia there is such a thing as the worst Sherlock Holmes movie ever made. That is not the fault of Jenny O’Hara who plays Dr. Joan Watson a social worker that is assigned to Sherman’s case. She gives a fine performance and the film is filled with well recognized character actors who TV fans will recognize. 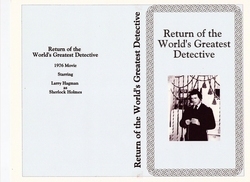 The premise of the made for TV movie is that Sherman Holmes (Larry Hagman, who is usually a good actor) is a bumbling motorcycle cop who admires his namesake Sherlock and wants to be like him. Sherman’s motorcycle falls off its kickstand and falls on his head. (Got a clue where this is going?) Yep, he wakes up thinking that he’s Sherlock. There are all kinds of references to Holmes stories and a landlady named Hudson. A good part of the plot is a combination of The Red Headed League and A Scandal in Bohemia. It is supposed to be a comedy, but just isn’t funny. Hagman just doesn’t make it work. Nicholas Colasanto plays the police lieutenant; most people will remember him as “Coach” from the TV series “Cheers”. He, like Jenny O’Hara, does an excellent job. The writing for the movie is poor so maybe it’s not all Hagman’s fault. Fortunately it’s almost impossible to find a copy of this film. Jenny O’Hara was born Patricia Joanne O’Hara in 1942 in Sonora, California. Her entire family was involved in the theater. Her mother is the well-known Edith O’Hara who runs the 13th Street Theater in Greenwich Village. Her brother and sister are also performers. She went from theater where she played opposite such people as Alec Guinness to movies and TV. From the time she started in TV and movies in 1975 until NEXT YEAR (Unfair and Imbalanced, post production, to be released in 2012) she has never been off the screen. Her film credits run for eight pages. She has appeared in such shows as Rockford Files, Charlie’s Angels, Barnaby Jones, Highcliffe Manor, Barney Miller, Law and Order, Boston Legal, and The King of Queens. Ms. O’Hara performs equally well in comedy or drama. She was an excellent Watson.